Posted by shonaliganguli in General. In late July I completed a week-long consultations tour at the invitation of the British Council India, visiting two locations – the English and Foreign Languages University (EFL-U), Hyderabad, and the Central Institute of Education, Delhi University. The aim of my visit was to initiate a three year (2013-16) project plan for an ELT Research Survey of India, adapted from the UK ELT Research Directory (a British Council funded initiative for which I have been the primary consultant). The proposed Survey will, for the first time, bring information about ELT research in India onto a single, fully-searchable online platform. 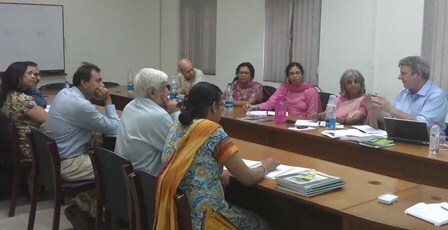 While The British Council is the prime mover behind this project, work is in progress regarding a multilateral partnership between Warwick University, EFL-U and Delhi University in the first phase, and growing in subsequent phases with British Council contribution and management tapering off in a planned manner. project planning for all three years of the programme. This visit included consultations with over 30 leading academics in ELT from seven key ELT and Education organisations across India (with two joining the Hyderabad consultations and the other five the Delhi one). Debanjan Chakrabarti, Head of English Research and Publications for the Council in India, also secured an important meeting with Dr Jagdish Arora, Director of INFLIBNET (the library network that connects all HE institutions in India). He immediately saw the merit of the project and offered to host it on the INFLIBNET server, subject to a MoU /contract that is also ratified by his organisation. In addition to the core project consultations and planning, I also conducted a series of capacity building and mentoring symposia – two in Hyderabad (one for 40 Ph D and M Phil students, and one with research supervisors) and one in Delhi, jointly with Professor Rama Mathew, Dean and Head of the Department of Education / Central Institute of Education, for 30 PhD/ M Phil students and academics. Prof Mathew and I had previously made the final recommendations for the first ELT Research Partnership Awards, the results of which were publicly announced on 29 July. The talk has been recorded and will be edited and shared on the British Council India website as part of capacity building support for ELT research and also to provide guidance for the next round of ELTRP Award applicants. It was evident from my consultations with academics and other leading ELT professionals, from evaluating the ELTRP applications and from conversations with research students in ELT and Education that there are pressing needs for support and research capacity building in the field of ELT in India which the British Council is beginning to fill. Contribution by Sneha Rao, participant at the Re-Imagine Edinburgh Youth Summit held in August. It’s always those few words which have a more lasting impact than the events themselves! Story of East India Company and its escapades which led to merging of Scotland and UK was fascinating. It helped us understand how Scottish identity was separate from UK identity and how the collaboration between India and Scotland is older than interactions between India and Britain. This was a statement which made me introspect a lot. We come to think of unity in diversity a lot…But when it comes to local community –that unity starts fading away. That is probably the primary reason we see clean houses but unclean localities -as that feeling of ownership among locals is just not there. This also leads to poor quality of citizenship and involvement in issues related to local governance. I think this root cause needs to be looked in a little more depth before I can formulate my mind on specific ways to improve community cohesiveness. I think it was a beautiful way to put forth the power of youth. Before coming to the conference I was sceptical – what do we as youths bring to the table which more knowledgeable and experienced people can’t bring? It’s the naivety which makes us audacious enough to question the un-ask able questions. And the brilliant motley of crowd which was present did ask some thought provoking questions – which wouldn’t have been asked otherwise. It poses larger questions about access and individuality of cultures. Trade is different from culture in a way – that it has no soul to it. You could have very open ties in trade and it will always be beneficial for both the economies. But does the culture loose its soul if you make it very accessible? From Edinburgh, I was travelling to London and in London I saw a man playing bagpipers in the busy oxford street – the music couldn’t look more out of place, especially after hearing the local version of it in Scotland. I have to admit it must have made few people inquisitive about Scottish culture after hearing them – but does the music looses it soul in the process of tweaking it to suit the tastes and sensibilities of everyone? One can’t box a culture and put it in a building. Attempts made to do so are probably with the intent of documenting them – so that the knowledge about them is not lost. Yes one can go to museums to see that culture that once was- but you have to really see the streets to understand the culture that is. Hence in context of Indo – UK relationships one must ensure the bottom- up approach where people at grassroots in both countries interact with each other. At the end of the day this is what would create lasting understanding of each other’s cultures. On the subject of student visas we had a very enlightening conversation. We realised while Indian students view student visas as an opportunity to begin working in that country after work. People in UK take the definition of rules very seriously. For them student visa ends when the semester ends. After which if someone stays further it’s breaking of rules. It was amazing to see the live examples of this on my trip to London – I was so surprised to see queues even in escalators in underground and the seriousness with which queues are taken. India on the other hand is built on chaos and it is almost a necessity given that the country accommodates 1.2 billion people- we have to have a flexible perception of rules! The context in which this line was said was itself a remarkable conversation. But writing few lines on this subject won’t let me appreciate the depth of this conversation. India had a similar opportunity during commonwealth games but sadly we couldn’t leverage that to create a lasting impact on the way sports is treated in our country. As against UK which targeted various areas like sports infrastructure, sports culture in young adults etc. Also, the values of inclusion it stood for were reflected where they ensured women representation from every contingent- which makes Olympics stand for much greater things than sports. The concepts of liberty, fraternity and equality emerged with the French revolution. Before that the concept of looking down upon women, certain races was not frowned upon. There were colonies whose riches were used to fund the deficits of colonizers. Such history when viewed with current lenses – leads to bitterness towards perpetrators. Logically speaking, retribution for historic events doesn’t make sense. But practically speaking, such animosity is hard to part with. Rewriting history might not be the most ethical thing to do, but perspective building on historic events needs to rational. We must ensure we impart objectivity and rationality to impressionable minds of young kids so that they themselves can see the events of history in a more objective light. To make common man interested in the future of 2 countries , they can’t be convinced by mere dialogues, it has to be an incentive much more tangible than that. Hence a bottom up approach where we ensure continuous interactions between people of both nations- via sports exchanges, student exchanges at university and school level, teacher exchanges and many other cultural exchanges would always work well to create that spark of interest about the partner nation. Which goes on to say – that all of us were greatly influenced by various perceptions and various interpretations of interesting themes that emerged during the conference but now is the time to reflect how we can take it to the next level and contribute at an individual level! Posted by shonaliganguli in General, Re-Imagine: India-UK Cultural Relations in the 21st Century. There is certain beauty about the very air of the city of Edinburgh. the extraordinary culture of this place. becoming a threat to the soul of the culture? we are getting as individuals and as a society. together! The night of Biryani and the Banofee Pies. Scotland and I found myself respecting this Nation even more! and greater cultural and sports ties between the two nations. on pulling off a great presentation which we built together as a team. Cheers to a great new future. Some say that variety is the spice of life and I couldn’t agree more after attending the five-day Active Citizens Facilitators Training held at Tata Institute of Social Sciences in Mumbai, India, from 23rd July to 29th July 2011. I have been active in the international development scene for quiet a while now and I was expecting another useful but bog standard training event which will not only give me skills in becoming a better workshop facilitator, but will also help me become a part of the world-wide Active citizens community. I couldn’t have been far from the truth! The five days i spent at TISS helped me to not only formulate a better way of working in the third sector but it also gave my belief in the importance of social work a new lease of life. The people, the stories and the real-life examples of social empowerment were only the tip of the iceberg, and before i knew I was surrounded by pioneers of south Asian social sector, rich conversations developing real projects, strong opinions challenging anything which went against the benefit of the masses, and real people who don’t just do social work, they live it! Actors, Directors, literacy workers, respected academics, forum theatre practitioners – almost everyone in the group had a unique skill set which complimented the needs of the group and i can only credit that to the amazing work by a well organised British Council team. Each and everyone invited by BC absolutely deserved to be there and as if like cogs of a wheel each one of us was important to the five day training in some way or the other! The two facilitators – Mike and Dan did an amazing job at bringing the group together as one cohesive force and seek real solutions to the social problems around us. It was their exercises; energizers and team activities, which really help us, nurture hive thinking. By the end of the training almost everyone had a full idea of what they want to do with the training and how the relationships we had formed during the five days in Mumbai could help each other achieve development goals . I’m now a thoroughly converted Active citizen and I’m looking forward to training a further 30 in Birmingham, UK. It was a really good experience, one people might call ‘life affirming’ and I look forward to developing social empowerment projects in India, Pakistan,BangladeshandSri Lankawith the help of my new-found NGO family!